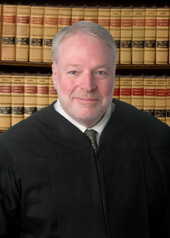 A native of Fairfield, Connecticut, Judge Carroll practiced law in his hometown for seventeen years prior to his appointment as a Judge of the Superior Court in 1996. Since his appointment, Judge Carroll has served in Norwalk, Danbury, Waterbury, Milford, Derby and Bridgeport handling civil, family, housing and criminal matters. He served for five years as the Administrative Judge for the Judicial District of Danbury and his most recent assignment on the bench was as the Presiding Judge for Criminal matters in the Bridgeport G.A. Chief Justice Chase Rogers appointed Judge Carroll as the Deputy Chief Court Administrator on September 1, 2007. Judge Carroll serves on the Chief Justice’s Public Service and Trust Commission and he chairs the Branch’s Criminal Commission. He also serves as co-chair of the Criminal Justice Information Sharing Governing Board and co-chair of the Victim Services Advisory Board. Judge Carroll is a member of the Criminal Justice Planning Advisory Committee and the Permanent Sentencing Commission. In addition to his other duties, the Chief Justice has charged Judge Carroll with the management and supervision of all matters relating to Judicial Marshal Services.